Einbender Studios is committed to making wearable art that is both an expression of our individuality and our kinship to each other. I have found that the human face evokes echoes from our collective past and bridges differences in age, culture and background that normally separate us. As a lifelong student of mythology and ritual, I believe in the necessity of bringing the presence of mystery and magic into our daily lives. 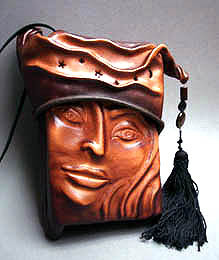 Purse # 34A w/ sculpted lid, chocolate, 7 " x 5"
Wearing a mask is to participate in a celebratory experience that links us back through time to the place from which archetypes arise. It connects us both with our ancestors and with what it means to be human. Putting a mask on a wall can serve as a reminder that we are much more than our mundane, rational selves. Wearing a purse with a face can be a subtly subversive act that works its own magic, producing smiles and conversations among strangers wherever it goes. I am the third generation in my family to make my living in the ornamental needle trades. Some of my earliest toys were gold bullion emblems, designed for fraternal lodges, felt appliqué poodles, and patches for children's sleep ware and jeans jackets. Since l970 I have been working as a designer and leather crafts person, making one of a kind and limited edition clothing and accessories. In l987 I founded Einbender Studios, (formerly Scarlet Leather), as a full time business and began experimenting with molding leather masks using techniques borrowed from Renaissance Italy. See Masks, my new line of Pocket Purses, and discontinued and discounted Pursona Bag “seconds”.